A harmonic is a “bell like” tone that’s produced by just lightly touching a guitar string in a specific place with a left hand finger and plucking the string. What we’re going to be talking about in this guitar lesson are natural harmonics. These harmonics are produced from the open strings of the guitar only. There are other techniques for playing harmonics (artificial harmonics, touch harmonics, tap harmonics, pinch harmonics) but they will be the subjects of another lessons. First we’re going to take a look at how to play natural harmonics on the guitar, and then look a little more in depth look at what they are. For the moment just think of harmonics as notes on the guitar that have a little different tone than normal notes. Go to the 6th string and touch the tip of any finger to the string right above the 12th fret bar. Normally when you play a note at the 12th fret, you are pressing down just to the left of the 12th fret bar. When playing a natural harmonic you’re going to be very lightly touching the string (not pressing down) over the fret bar, and not to the left. While lightly touching the it, pick the 6th string. Right after you play the string, lift your left hand finger off. This will let the harmonic note ring louder and more clearly. If you were to leave your finger on the string, the harmonic would sound, but would be more muffled. If you lift up your left hand finger to soon, then you will hear the open string. This takes a little practice to get the right timing. Notation for guitar is far from being standardized. Here are some of the ways that you will see natural harmonics written in both tablature and standard notation. The diamond around a fret number indicates a harmonic in tablature. Harm stands for, your guessed it, harmonic. N.H. stands for natural harmonic. In tablature found on the web, the number is surrounded by < > which is the closest thing to a diamond in plain text. In standard notation the note heads are written as diamonds. The line or space that the note is written on is not the pitch being played. Instead, this is the note that would sound if your where to play the note normally at that fret. Some indication would have to be made as to which string this would be on. The most common places to play natural harmonics are at the 12th, 7th, and 5th frets. Practice playing the harmonics on all of the strings at these frets. There are more places to play harmonics, and you will be learning them soon enough. But work on getting a good sound on these first. OK, now you have a basic understanding of how to play natural harmonics on the guitar. Now let’s take a look at how they are created, and some other places you can get natural harmonics to ring. Normally when you play the note at the 12th fret on any string, you are shortening the length of the string that is ringing and getting a higher pitch. The string is only ringing from the fret bar that you are pressing down at, to the bridge. On the other hand, if you are playing the 12th fret harmonic, the string is actually ringing on both sides of where you are touching. The only part of the string that is not ringing is where you were touching the string. The point of the string that is not ringing is called the node. The string is ringing in 2 divided sections. Now play the harmonic at the 7th fret. What is happening here is that the string is ringing in 3 equal parts. There are 2 nodes, one where you touched the string at the 7th fret, and another at the 19 fret. If you go to the 19th fret you will notice that the harmonic is exactly the same as the 7th. After you play the harmonic at the 7th fret, try touching the string at the 19th fret. You will notice that nothing happens. This is because the string is not ringing at that point. But if you touch the string in at any point other that the 7th or 19th frets, the string will stop ringing. Next play the harmonic at the 5th fret. In this case the string is ringing in 4 equal parts. When you played the harmonics at the 7th and 19th frets, you got the same exact harmonic at both of these nodes. In this case, only the 5th fret and the 24th fret will sound exactly the same, and the 12th fret will sound an octave lower. So even though the 12th fret is a node, and is a part of the string that is not ringing, you cannot get the same harmonic as the 5th fret to ring there. Note that most guitars do not have 24 frets, but the node is where that fret would be. If you take any string at the same tension, and make it half the length, you will raise the pitch by one octave. As you keep dividing the string in half, the next octave up is a shorter and shorter distance each time. Playing a harmonic at the 12th fret divides the string in half, so the note that sounds is an octave higher that the open string. Playing a harmonic at the 5th or 24th fret divides the string in to half yet again, so the notes sound an octave higher than the 12th fret harmonic, This is also why the frets get closer together as you move toward the bridge. It takes less and less distance to get to the next higher note. The process of dividing the guitar string could continue. Each time the string is divided into more parts, and shorter parts. The shorter the part that is ringing, the more difficult it is to get a harmonic to sound. In fact you will notice that on the last one I play in the video guitar lesson (dividing the string into 10 parts) doesn’t have all that strong of a sound. I have other guitars with different pickups that will produce a stronger sound. Here are the places to play the different harmonics in the order of the number of parts the string is divided into. If you see decimals (3.2, 2.7, etc.) this is just an approximation of where you should put your finger. The higher harmonics do not fall right over the fret bars. I could play other frets to get some of these same harmonics to ring. This is something that we will be taking a look at next. But here you can easily visualize the parts getting shorter as you move your hand towards the nut. Be sure to use a lot of distortion if you are playing on an electric guitar. If you are playing an acoustic, you my have some trouble getting the higher harmonics to sound. OK, here are all of the natural harmonics on the guitar. 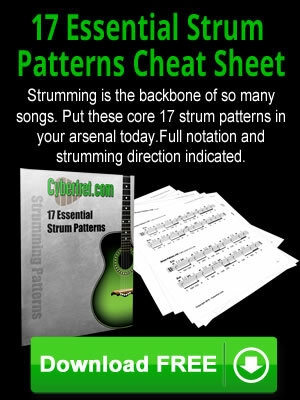 This does not include the ones that you could play beyond where the guitar has frets. It would be very difficult to explain where they are, so you can do your own experimenting. When learning the names of the notes that are created by playing harmonics, there are two techniques you could use. One is to relate the pitch to the open string. The other is to relate the pitch to the note that would normally sound if your were to press down and play normally at that fret. Which one you use will depend on the particular harmonic. I will explain both where it is practical and put a * next to the one I think is easiest to use. You of course will need to know the names of the notes on the neck of the guitar. To understand things like Major 3rd, Perfect 5th etc., you will need to understand the some music theory and intervals. * Sounds and octave higher than the harmonic at the 7th fret. Sounds 2 octaves, plus a Minor 7th above the open string. Learning the basics of playing natural harmonics on the guitar is easy. Exploring all the possibilities is a little more of an adventure as you can see from this guitar lesson.